Photography is a hybrid tool of the artistic and scientific process in which the inception and revolution had grown alongside colonialism. Colonial photography serves as objective historical documentation, and at the same time, it also alludes to an illusion of European superiority over the colonised others. Many contemporary artists have been taking notice of certain tropes in the preserved images of the past and began to incorporate them into their works as a way to address and examine the colonial authority. 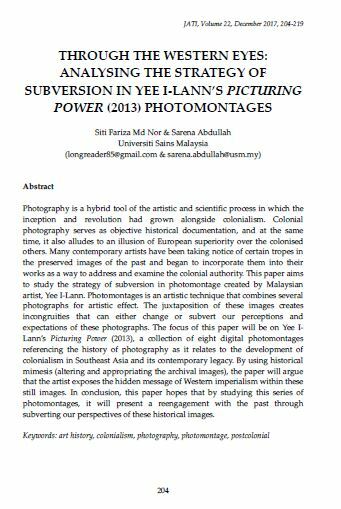 This paper aims to study the strategy of subversion in photomontage created by Malaysian artist, Yee I-Lann. Photomontages is an artistic technique that combines several photographs for artistic effect. The juxtaposition of these images creates incongruities that can either change or subvert our perceptions and expectations of these photographs. The focus of this paper will be on Yee I-Lann’s Picturing Power (2013), a collection of eight digital photomontages referencing the history of photography as it relates to the development of colonialism in Southeast Asia and its contemporary legacy. By using historical mimesis (altering and appropriating the archival images), the paper will argue that the artist exposes the hidden message of Western imperialism within these still images. In conclusion, this paper hopes that by studying this series of photomontages, it will present a reengagement with the past through subverting our perspectives of these historical images. MD NOR, Siti Fariza; ABDULLAH, Sarena. THROUGH THE WESTERN EYES: ANALYSING THE STRATEGY OF SUBVERSION IN YEE I-LANN’S PICTURING POWER (2013) PHOTOMONTAGES. JATI - JOURNAL OF SOUTHEAST ASIAN STUDIES, [S.l. ], v. 22, n. 1, p. 204-219, dec. 2017. ISSN 2600-8653. Available at: <https://jati.um.edu.my/article/view/10255>. Date accessed: 26 apr. 2019. doi: https://doi.org/10.22452/jati.vol22no1.14.